Our candy coated fortune cookies make for an irresistible and unforgettable confection experience. Freshly baked fortune cookies, filled with your choice of message type and dipped with your choice of candy flavor dips. With a variety of colors and flavors, your options are endless. 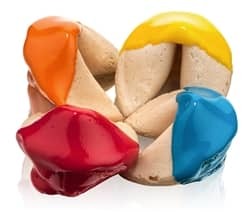 Freshly baked fortune cookie dough, neatly sealed with your choice of message type and dipped into your choice of color and flavor. You can even make your cookies gluten free. Each fortune cookie arrives individually wrapped to ensure freshness and quality of the product.